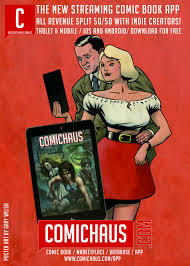 Issue 3 of ComicScene, sponsored by Comichaus.com, is out 25th April and you can pre order it at http://www.getmycomics.com/ComicScene or any comic shop or newsagent in the U.K. and Ireland. In Issue 3 we celebrate Free Comic Day on 4th May with a look at the Funny Pages from Rebellion and Doctor Who from Titan Comics, including an interview with creator Jody Houser. DC Thomson provide us with an exclusive behind the scenes feature on the design and development of the cover for the new Heritage Comics book ‘The Art of Ian Kennedy’. We also have an interview with Ian too. The final part of the three part first ten years of Marvel UK ends, including a look at the early work of Alan Moore, the Hulk, Doctor Who and Star Wars. For all you Marvel fans, particularly Captain Marvel, we talk to Roy Thomas ahead of his Portsmouth ComicCon appearance (which we also cover) and we feature the new War of the Realms too! Corker! takes a look at the new Cor!! And Buster comic, out 17th April, and artist Lew Stringer takes a personal look at the strip he drew for the comic with ComicScene writer John Freeman. We also have our own comic strips including Whackoman! and the second part of Our Land – yup, the aliens are coming… don’t miss part one in ComicScene Issue 2 which you can get in shops now. We feature more indie comics in our 9 page State of Independent’s section including Space Captain and the Misty inspired Bite Me! Pat Mills also begins his journey producing a 2000AD for the 21st Century – Space Warp! We continue or coverage of the latest comic inspired TV and film including early storyboards for Game of Thrones and the new Avengers Endgame Movie. It’s shaping up to be another great issue of ComicScene – pre order now at http://www.getmycomics.com/ComicScene (and if you can’t get to a comic shop register and order your conics on our online site now) or pick it up at your favourite comic shop or newsagent from 25th April. Hope you enjoy it!